If you are an old friend , or a new one, welcome to my website. If you are fluent in the language of Tarot, or are a complete sceptic, the welcome is the same. Sue now also does reading till late on a Friday evening ( 8.30pm) as late evening bookings are often requested, but these will have to be prepaid to be accepted and are non refundable if you cannot attend. 'Bide the witches Law you must, in perfect Love and perfect Trust. Sue has been psychic since birth, a trait running in her family for many generations. She is a predictive clairvoyant medium, and reads clairvoyantly, clairgnosticaly and clairsentiently, with spiritual guidance ,as she has for many years. Sue does not ever employ others to do her readings. Each and every reading is done personally by Sue, which is why you may have a little wait for a booking. 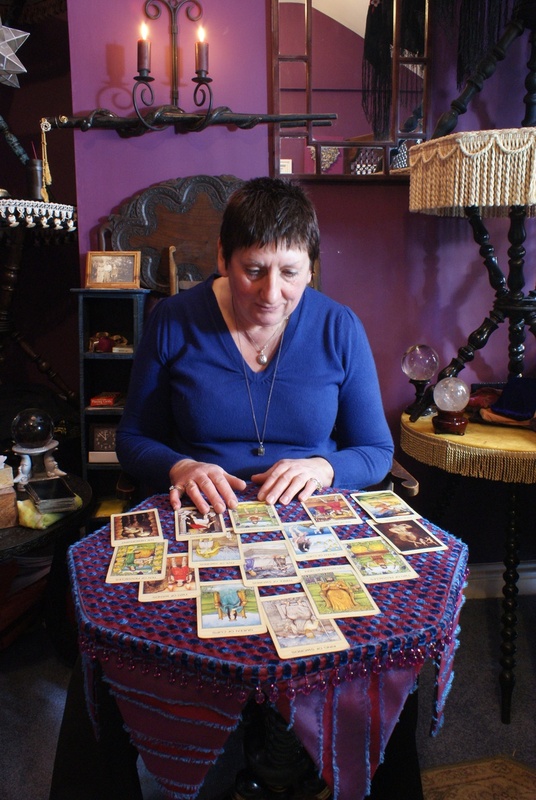 Sue will go through many spreads; She works quickly, reading the Tarot as a language, not as other readers who sit and enthuse about one card at a time. The Gate way of Fate spread starts a Tarot reading, with the client just shuffling the full pack and thinking about themselves. The cards will then tell a story with Tarot or Gypsy cards or both , depending on which pack you choose, about your past, and how you feel about it, your present and how you feel about it, and your future , and how you should expect to feel about it, all without being required to say anything, you just shuffle the cards and just think about yourself. At the end of the reading you are given two or four further questions to ask by email only ; within the next two months, in case there is anything that you have forgotten to ask. Sue reads person to person, by telephone and by email, as you will see from her testimonials, all are reviewed as being as accurate as each other, both here, and across the World. A CD can be made on face to face, or telephone readings, at a cost of £5, and will be sent on to you,(or be ready to collect) 48Hours later. This as an MP3 recording can also be sent as an email attachment. That way your reading and appointment won't be lost, and ongoing readings are undisturbed. There are choices of times and dates,and types and prices of reading here, and ways to pay however if you are having problems booking you can phone Sues shop on most weekdays, and you can make an appointment for face to face readings over the phone on 01234 327090. Appointments are always best booked through the book a reading page as Sues memory is not always focused on the here and now, and she would not want to forget your reading. (Click here) where you can make choices of day ,time, and type of reading,and pay if you want, at the same time, through PayPal or by credit card. Psychics have been told by the Government that we have to add to our details the fact that readings are for entertainment only.This would seem to make it easier, rather than harder for charlatans to operate,but we have to follow the national guidelines. Advice on readers would always be to go to someone of whom you have had good reports through word of mouth or personal experience. Certainly there are readers who will be more interested in your money than of giving good value. Its your money, so you should be careful that it is not wasted.Check out your potential reader before you decide on a reading.If its local to you, ask around, a good reader is usually pretty well known locally,and bad reports are not usually shy of coming forward if you mention that you are trying to find someone accurate. if the reader is far away from you, try a test question, to see if your reader will answer it to put you at your ease.this should be one small question, as you wouldn't want your reader to feel that they were being taken advantage of by people trying to get free readings either. Due to the delicate nature of Sues work, please do not expect unscheduled readings. If you phone, you will be asked to make an appointment, so that current readings can run smoothly. Sue reads for clients daily but does not work on Sundays or Wednesdays, except by prior arrangement. Please respect her need for a break on these days,and contact via email or text only, at this time , rather than by phone.